The property is situated in Watergrasshill, a commuter village served by an excellent road infrastructure providing easy access to Cork city centre via the Dublin M8. The property fronts Cork Road at its northern boundary and the slip road from the Dublin M8 at Junction 17 to its southern boundary while also situated alongside the exiting roundabout. The property is conveniently situated in close proximity of the village centre and National School. Watergrasshill is an attractive commuter village strategically located just off the Dublin M8. The village has a rural population of approx. 1,464 according to the CSO preliminary results for Census 2016. 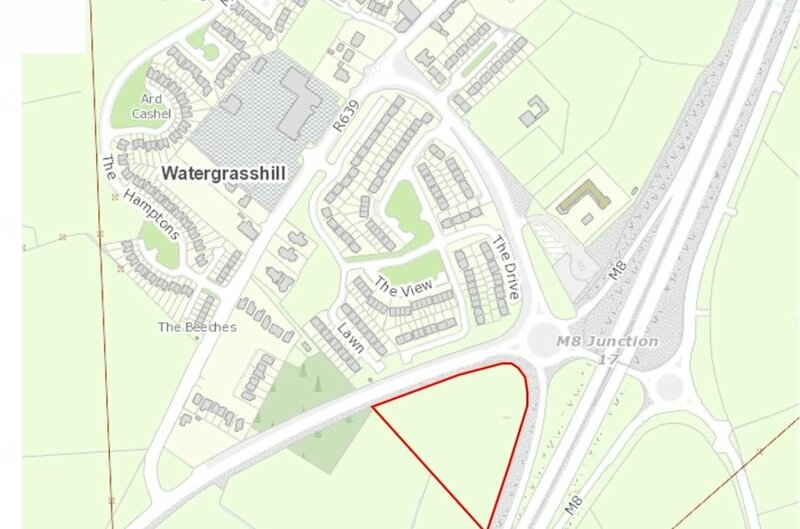 Watergrasshill is conveniently located approx. 15km south west of Fermoy town and 19km north east of Cork city. The property comprises an irregular shaped greenfield site extending to approximately 1.8 hectares (4.45 acres) with an easy to work with topography. 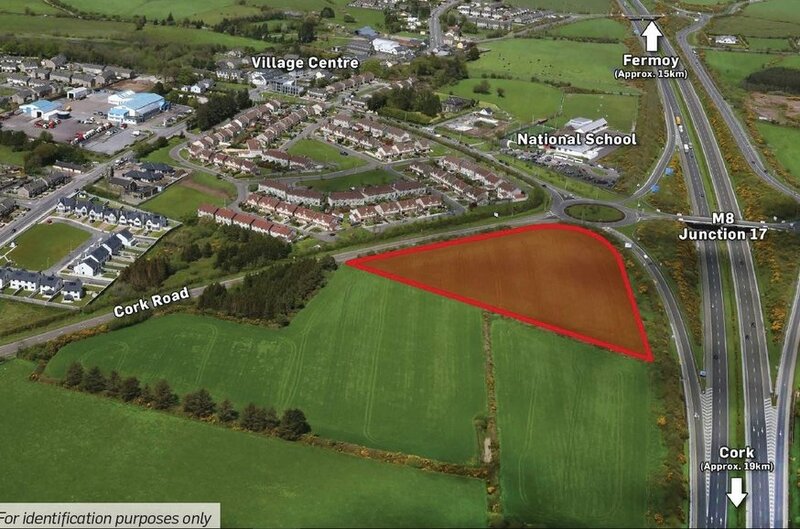 The property has extensive road frontage of approximately 180 metres to the southern boundary fronting the M8, 160 metres fronting Cork Road to its northern boundary and approx. 40 metres fronting the exiting roundabout from the motorway. The site is suitable for a motorway service station and ancillary accommodation subject to planning permission. The property is situated within the settlement boundary of Watergrasshill in the Fermoy Municipal District Local Area Plan 2017 with specific zoning for ‘Business’. Proposals are to be submitted no later than 12.00 noon on Friday 19th October 2018.